The new Metro Tunnel station in North Melbourne is part of plans for urban renewal in the broader Arden-Macaulay precinct. Over the next 30 years it is expected that the area will become home to 15,000 residents and more than 34,000 jobs, directly connected to the train network via the Metro Tunnel. 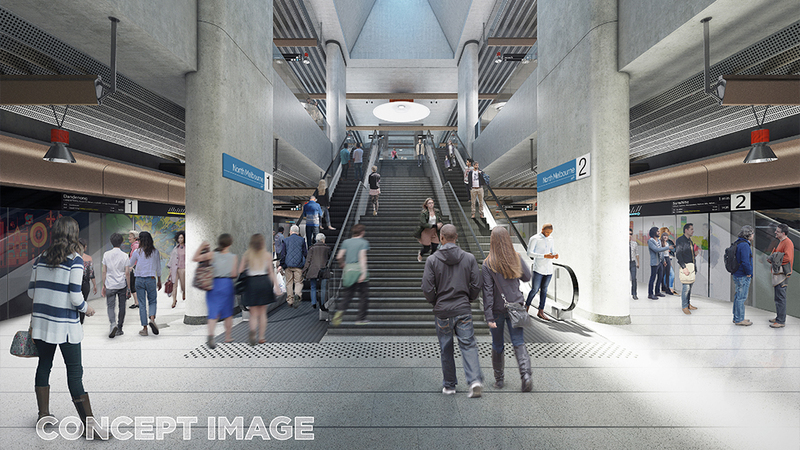 Following our public submission process, the new station will be known as North Melbourne Station. The existing North Melbourne Station will be renamed West Melbourne to better reflect its location. The new underground North Melbourne Station will be located near the corner of Arden and Laurens streets. The station entrance will be located on Laurens Street, between Queensberry and Arden streets to provide direct access to existing residential, retail and commercial areas east of Laurens Street. Provision will be made for an additional entrance at the western end of the station to service the Arden area as it develops in the future. The Metro Tunnel station will set the tone for urban renewal and will reflect the industrial character of inner North Melbourne. Its design will reference Arden's rich industrial history through the use of materials such as clay brick, bluestone, timber, steel and glass. A café will be included in the station, with terraces for outdoor dining. Public seating, garden beds and lawn areas will provide a new gathering place for locals and passengers to enjoy. As the broader Arden precinct is susceptible to flooding, the station entrance has been raised 1.5 metres above the existing ground level. Laurens Street will be upgraded to become a more pedestrian and public-transport-oriented street with additional tree planting. Barwise Street will be transformed into a greener, more pedestrian-friendly laneway while maintaining access for existing properties. The new North Melbourne Station will be within walking distance of the North Melbourne Recreation Centre, Arden Street Oval and the existing route 57 tram, providing the opportunity to create a truly sustainable transport precinct. Universal access parking bays conveniently located near the station entrance. The new station precinct will provide new landscaped public space featuring predominantly native species. A new station plaza will provide a bright, safe and welcoming place for passengers and the community to enjoy. Sustainability features include tree pits and garden beds in the station plaza and the planting of more trees in Laurens Street to capture stormwater, provide shade and assist with air quality. Recognising that the broader Arden precinct is prone to flooding, designs for the new station ensure that stormwater runoff is slowed and collected for re-use via rain gardens, street planters and other water-sensitive urban design. For example, drainage at the station has been designed to capture the natural flow of rainwater and distribute it into nearby garden beds.